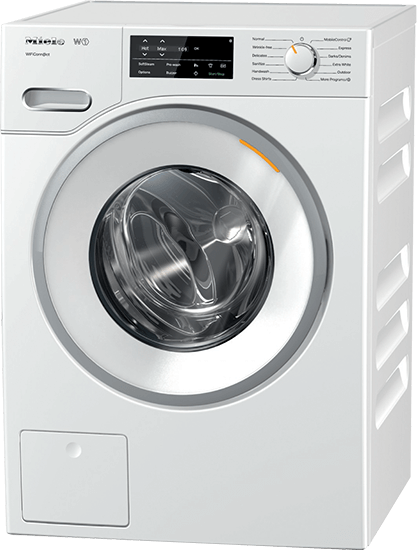 Depth with door open (Inches): 41 1/2"
From March 29, 2019 until April 25, 2019, inclusive, purchase the WWH660 or WWH860 washing machine and receive a FREE supply of UltraPhase 1 and UltraPhase 2 detergent AND SAVE $200. This offer is valid on Miele W1 Washer models WWH660 or WWH860. The FREE detergent consists of two (2) x UltraPhase 1 cartridges and one (1) x UltraPhase 2 cartridge, a value of $89.97 (before taxes). These will be shipped with your washing machine delivery. From March 29, 2019 until April 25, 2019, inclusive, purchase the WWF060 and receive a FREE supply of detergent AND SAVE $200. This offer is valid on Miele W1 Washer model WWF060. The FREE detergent consists of two (2) x UltraColor Detergent (1.8 kg), one (1) x UltraWhite Detergent (2.5 kg), a value of $84.97 (before taxes). These will be shipped with your washing machine delivery. Full delivery must be taken by November 30, 2019. A 20% restocking fee applies to all product returns. An administrative fee of 10% applies if order is cancelled or terminated prior to delivery for any reason and is based on the deposit for product(s). If your order contains only dishwasher and/or laundry appliances, the delivery restrictions set out above apply without exception. In the case your order contains additional major domestic appliance products from the categories of Built-in Cooking, Cooktops, Ranges, Ventilation, Refrigeration and Built-in Coffee, there are no required delivery dates. These delivery terms are based on all orders completed in the Miele MCA system between March 29, 2019 and April 25, 2019. Accepted methods of payment for the down payment of 25% at point of sale are American Express, Visa or MasterCard credit cards. Outstanding balance(s) are to be settled prior to delivery. Methods of payment for outstanding balance(s) are American Express, Visa, MasterCard or electronic bill payment for orders where total order value before applicable taxes is less than $15,000. For orders where total order value before applicable taxes equals or exceeds $15,000 before applicable taxes, the method of payment for outstanding balance(s) is electronic bill payment only.